With a shared goal of enabling workers to live and work with dignity, there’s been a close linkage between the American labor movement and the Gay Rights movement that stretches back more than 80 years, and the struggle for equality has shown some dramatic results. In the 1930s, Stephen Blair, an openly gay man, was elected as the vice president of the National Union of Marine Cooks and Stewards. The union was derided as “red, black and queer” for its liberal views and its embrace of minority rights. Blair’s life partner, Frank McCormick, was a vice president for the California Congress of Industrial Organizations and was instrumental during the West Coast longshoremen’s strike in 1934, which led to the unionization of every port on the west coast. Harry Hay, a longshoreman from the Bay Area in California, founded the Mattachine Society in 1950, one of the first Gay Rights groups in the nation. Hay used the knowledge and skills he gained as a union organizer to put the group on the map, and the first five members of the group were union members. In the 1970s, a partnership emerged in San Francisco between the Teamsters and gay activists. Coors Beer had been administering lie detector tests to prospective employees. Included among the questions was whether the applicant was gay. A boycott of Coors was organized locally, spread nationally and reduced Coors’ market share from 40 to 14 percent. The success of the campaign cemented a relationship between labor and gay activists and helped elect Harvey Milk as a San Francisco Supervisor. Labor and the LGBTQI community repeated this success in 1978 when they worked together to defeat the Briggs Initiative in California, Proposition 6, which sought to ban gay people from teaching in public schools. In 1993, one thousand members of SEIU met at Local 250’s union hall in Oakland and founded its Western Conference Lavender Caucus. A few years later in 1997, Pride at Work, an organization dedicated to defending and promoting the rights of gay workers, formally affiliated with the AFL-CIO. 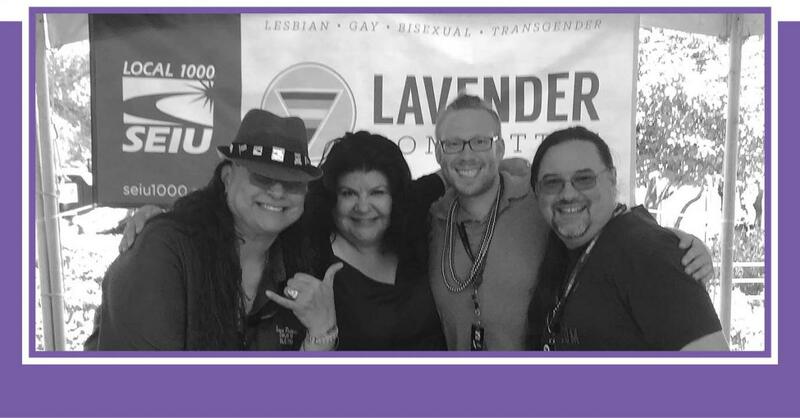 Our own Lavender Committee reviews the state’s policies, programs and laws that directly impact the Local 1000 LGBTQI family and the communities they live in. “We support all beliefs and all backgrounds and work to show the world we will not be divided by our differences,” said Maria Patterson, our Lavender Committee Chair, who works as a custodian at Caltrans, Stockton.